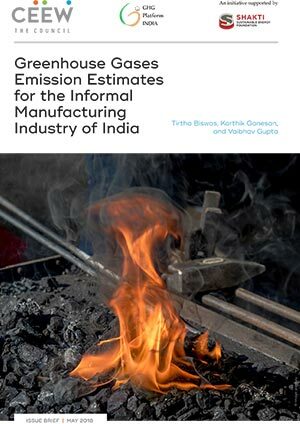 This study provides an in-depth assessment of greenhouse gas (GHG) emissions from the manufacturing sector (including construction) in India from 2005 to 2013. 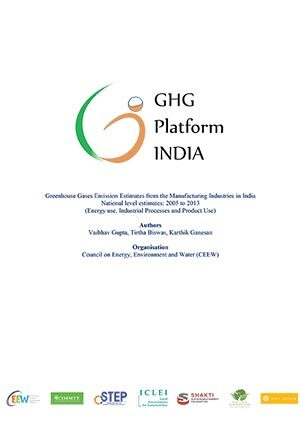 Part of The Council’s work as a member of the GHG Platform India, this report is a revised and updated version of previous estimates. It was published simultaneously with an estimate of national-level emissions. The study covers three key greenhouse gases, namely - carbon dioxide (CO2), methane (CH4), and nitrous oxide (N2O), which account for a large share of anthropogenic emissions from India. At the state level, 80 per cent of manufacturing emissions come from only ten states – Gujarat (14%), Odisha (13%), Chhattisgarh (10%), Jharkhand (9%), Karnataka (8%), Maharashtra (8%), Andhra Pradesh (7%), Rajasthan (5%), West-Bengal (5%), and Tamil Nadu (4%), as per 2013 estimates. 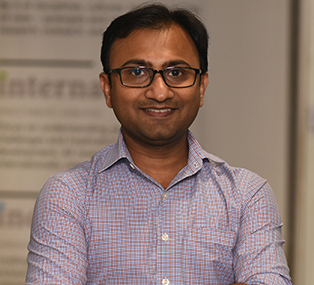 The study also provides insights on sector-wise GHG emissions estimation for all states and union territories, except Mizoram and the Lakshadweep Islands, since activity data is not available for these regions. Between 2005 and 2013, the overall GHG emissions from the manufacturing industry almost doubled from 315 million tonnes (MMT) to 623 MMT. Fifteen states contribute to nearly 95 per cent of all manufacturing emissions in India, with 80 per cent of manufacturing emissions coming from only ten states – Gujarat (14%), Odisha (13%), Chhattisgarh (10%), Jharkhand (9%), Karnataka (8%), Maharashtra (8%), Andhra Pradesh (7%), Rajasthan (5%), West-Bengal (5%), and Tamil Nadu (4%), as per 2013 estimates. Emissions from fuel use contributed between 65 per cent and 75 per cent of overall emissions during the period. Coal continues to be the dominant source of energy across the sectors, contributing nearly 70 per cent of the total energy use emissions. Its share in the energy derived emissions grew from 171 MMT of CO2e in 2005 to 385 MMT CO2e in 2013. Among states, based on 2013 estimates, industries in Odisha (13%) are the largest consumers of coal, followed by industries in Jharkhand (8%), Chhattisgarh (7%), and Karnataka (7%). The manufacturing sector in Gujarat – the largest emitter among states – is a major consumer of natural gas and its derivatives (23%), and second largest consumer of liquid fuels (12%). Manufacturing emissions from 11 states and union territories is dominated by liquid fuels, including Assam (36%), Bihar (53%), Haryana (49%), and Tamil Nadu (48%). Similarly, gas plays a dominant role in emissions coming from Arunachal Pradesh (99%), Assam (34%), Sikkim (65%), and interestingly – Uttar Pradesh (22%). Five states represent almost 50 per cent of the overall industrial process and product use (IPPU) emissions, with Gujarat (16%) being the highest emitter, followed by Maharashtra (14%), Rajasthan (11%) and Andhra Pradesh (9%). Among specific categories, Chhattisgarh (22%) leads the metal industry emissions, whereas Rajasthan (17%) is known for mineral (predominantly cement) sector emissions, and Maharashtra (40%) is known for chemical industry emissions. 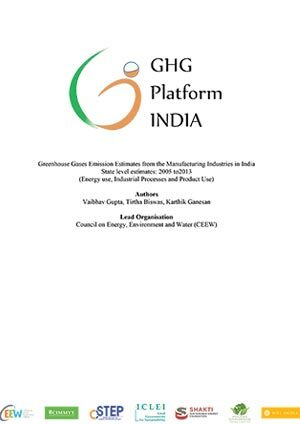 CEEW is the lead partner of the GHG Platform India for the development of emissions estimates from manufacturing industries. These estimates are also compiled into an overall Trends Analysis of GHG Emissions in India, published by the GHG Platform. Ten states contribute nearly 80 per cent of all manufacturing sector emissions in India, with Gujarat being the largest contributor at 14 per cent.